BANK of Ireland has claimed that rescue loans it has repaid to the State have helped to pay for public services and keep down taxes. The claim by chief executive Richie Boucher was made as he said his bank would seek to veto any proposal from Personal Insolvency Practitioners (PIP) featuring mortgage write-down for its customers. Bank of Ireland’s policy is only to write off mortgage debt in cases of bankruptcy or personal insolvency, where the bank is forced to make the move, chief executive Richie Boucher told the Oireachtas Finance Committee. And the bank will seek to recoup the outstanding balance on a home loan even after the property has been sold to pay off the debt, he said. The bank’s tough stance is in contrast to AIB, Ulster Bank and Permanent TSB, whose bosses had all said earlier in the week that people voluntarily selling their home to repay a loan could be allowed to walk away from any residual debts. Labour’s Kevin Humphreys TD said people would be better off bankrupt, rather than selling their home and remaining indebted to Bank of Ireland, given its hard line. But Mr Boucher said his bank’s apparently tough stance partly explained why it was the only bailed-out lender to have returned cash to the taxpayer. The €6bn repaid to the State by Bank of Ireland means “tax rates can be kept lower and services provided”, Mr Richie Boucher told the committee. 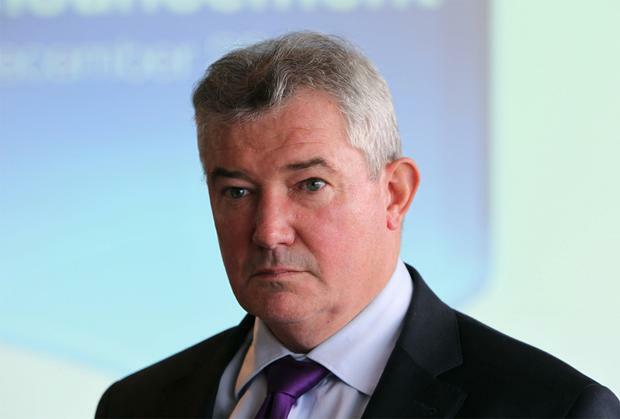 To date, Bank of Ireland has been involved in four personal insolvency arrangements (PIAs), of which it supported two and opposed another two –one of which was approved anyway, he said. It is significantly ahead of targets to restructure problem mortgages set by the Central Bank, Mr Boucher said. Offers had been made to 64pc of customers who are three months or more behind on their home loan, against a target of 50pc set by authorities. Numbers presented by the bank to the committee show around one in four “resolved” cases involves the loss of the home through either sale or repossession. Mr Boucher's €843,000-a-year pay was raised briefly. His pay is “transparent and clearly set out,” he told the TDs. Bank of Ireland is the last of the four main banks coming before the Dail committee this week. Mr Boucher’s appearace came after the bosses of PTSB, Ulster Bank and AIB appeared, and on the same day that the Department of Finance reported a fall in the number of homeowners who are in arrears on mortgages issued by the six biggest banks. New figures released by the department show that there are now just over 78,200 mortgage accounts that are three months or more behind on their payments at the big banks. The six main banks have put in place close to 14,693 permanent repayment plans for residential mortgage accounts that were in arrears in February. This is up by just over 200 since January, the department said. However, three out of four mortgages that are in arrears for three months or more have yet to be restructured. Banks have been moving away from temporary restructures for those in mortgage trouble, like interest-only, and offering to split mortgages and provide arrears capitalisation, where the arrears are added to the overall home-loan debt. The figures outline the arrears and the number of permanent repayment deals put in place by AIB, Bank of Ireland, Permanent TSB, ACC, KBC Ireland and Ulster Bank.